The other morning, I woke up in our master bedroom and thought to myself - I can't wake up in this room anymore. I must do something about this. Actually imagine the image above but with around 15 paint samples on the wall. I can't believe we have lived with this room for that long. So I told both sets of parents instead of gifts this year, we'd really like a donation to the "master bedroom fund" to finally fix this situation. At first I thought I wanted a light, bright room with creamy walls. After putting up all the samples I knew that wasn't us. I've had dark walls in my bedroom for the past 6 years and I really think it helps me sleep. Yay for gray! I can't wait to see it all come together. 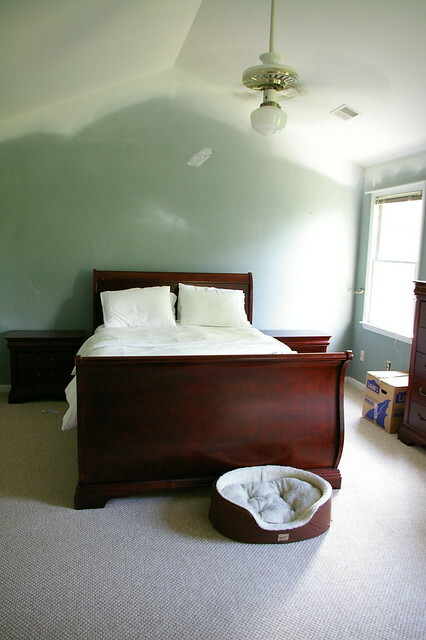 We are in the process of painting our bedroom BM Kendall Charcoal with white paneling below. I've never had dark bedroom walls and am loving it so far! I love the gray! Our master bedroom has been last on our list as well. Enjoy! Your post made me smile ... I woke up one day earlier in the year after pondering painting and said the same thing... I can't live with these yellow walls one more day and drove right up to the paint store and painted them then (gray)! Your color palette is gorgeous! 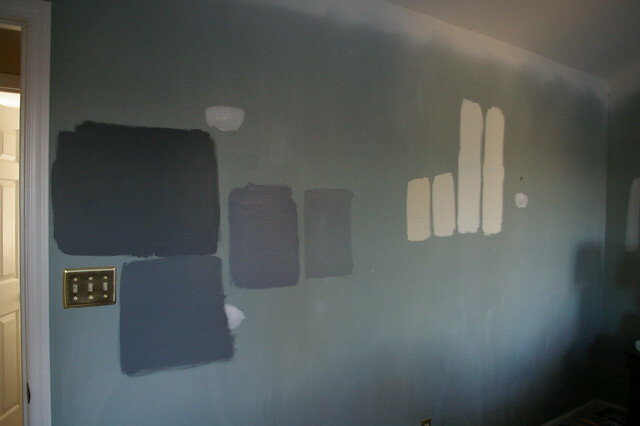 We just painted our guest bedroom a really dark grey (cant remember which one) and I absolutely love it. Might like the guest bedroom better than our mater. My project list is a mile long. I would like to get it all finished before our baby gets here, not looking good. I hope that the brass switch plate is on the way out too! Eeek! 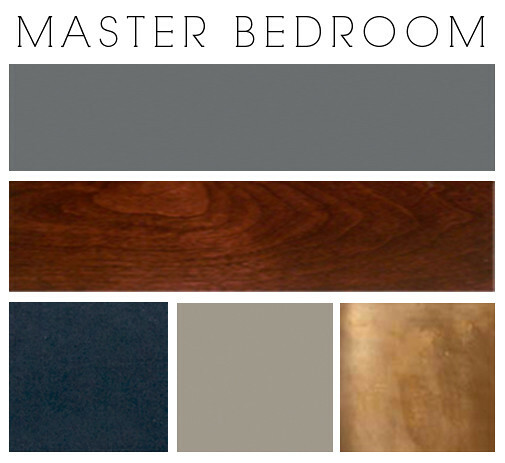 Our master bedroom is in similar dire state and your color palette is very similar to what I have in mind for ours. Can't wait to see what you do with it! I'm in the same situation with our master. Been in the house 8 months and I'm always so embarrassed to show it to guests. Loving your color scheme... masculine yet rich! Oooh, pretty. We've been in our home a little over a year and other than the guest bath haven't updated much in the way of paint. I wanted to just live and see how the light in the rooms is and how each room feels. I've decided we're going dark in our room and Gunmetal is actually one of the "maybes" so can't wait to see how yours turns out! 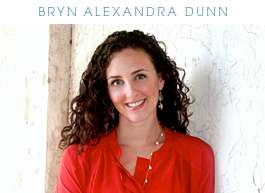 I love the plan so far Bryn! And so exciting that it will be completed soon...thanks to your generous family members! great colors! i bet you could make an amazing window seat in that room. your room is enormous! Love the gold in the color palette! wonderful room, can't wait to see the final result! 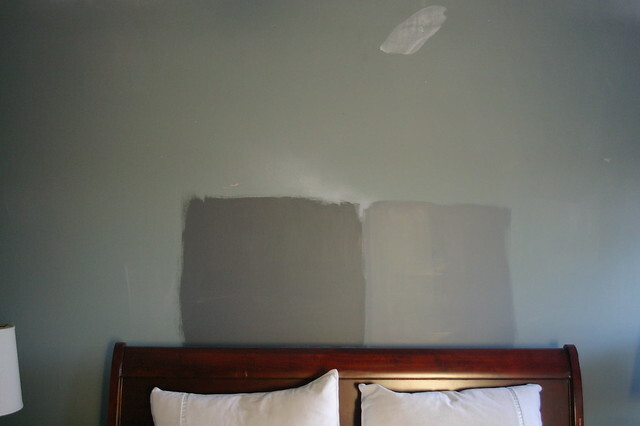 We also have gray on our bedroom walls, maybe a shade or so lighter, but I find it so soothing! Our bed is extremely similar if not the same one as yours! I'm just now doing a clients bedroom in gunmetal. It's a great color. Can't wait to see the results. I know it will look beautiful. Gorgeous Bed!Just divine and beautifully made!stunning bedroom! I love that color and think it will be so warm but elegant with the addition of your accent colors! MMMMMmmmm. I love the paint colour you went with. I just but a "gunmetal" purse. HAHAHA. Can't wait to see more posts about your master bedroom progress. We also asked for "kitchen fund" donations this Christmas. I am definitely a fan of a deep color and warm/cozy feel in a bedroom. It just wraps around you at night and helps you sleep in in the am!